Single slide of diffraction grating material. 13,400 grating lines per inch. Glass Mirror 4" x 4"
Aluminized 2nd surface mirror with ground edges. Economical and good for all types of optical applications! Glass Mirror - Flat 4" x 6"
Durable, aluminized 4" x 6" second-surface. Good for basic lab experiments or other projects. Second surface concave mirror. 7. Right Angle Prism, 10mm sides and 10mm width. Hypotenuse: 14mm. Optical quality K9 glass. Product is surplus and may have very minor edge chips. Good for experimentation and other optics projects. 5 flexible gelatin filters, each 4� square. Colors are yellow, orange, red, blue and green. Equilateral, 45mm sides. Has one hole for adding fluids to study refraction and dispersion. Comes with funnel and stopper. Glass Prism, high angle close to a RA prism (but is not). Suitable for experiments and prototyping. Sides are 24mm and 12mm respectively, with a 31mm 'hypotenuse'. Width is 19mm. Made of K9 glass. Uncoated, unaluminized glass. 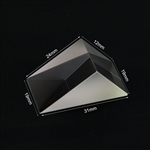 Note that this is a surplus prism and may have edge chips and surface defects. Acrylic prism, equilateral. 1" Sides and 2" length overall. Good for light experimentation and rainbow creation. 5 Acrylic color filters, each 2� square. Colors are yellow, orange, red, blue and green.